﻿We have a "Holy Ghost Surf Story" being published in a new book. 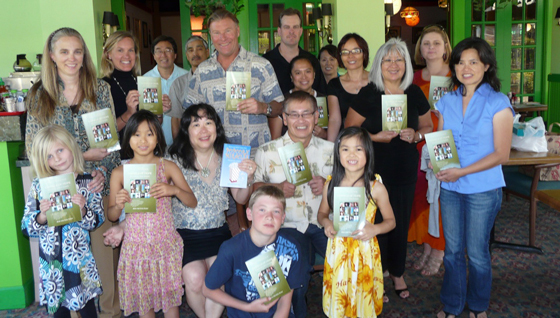 Kernels of Hope , edited by Bob and Gail Kaku, which will be released in July and has many inspiring and faith building stories including a testimony by Tim Tebow of NFL Quaterback fame. In our story,we share about a time in Spain when we experienced a huge swell on one of the Spanish coast's famed breaks and a divine appointment took place that led to a needed ride to France just in time to make a scheduled speaking engagement. This is the fourth book we've had supernatural stories published in. It is interesting to note that two of them involve "Holy Ghost Surf Stories!" God created the ocean and waves and it is interesting that He goes so out of His way to perform such miracles when we are just taking some time now and then to enjoy His creation! We’ve recently been ministering up on the Northern Central Coast of California in Salinas and Santa Cruz as well as attending a book event in nearby Sunnyvale for a new book that we just had a Holy Ghost story published in. Our story in the book tells about a time on the Basque Coast of Spain when we were in dire need of transportation to France. A unique divine appointment took place while actually riding a wave while surfing one of Europe’s most famed breaks on a big board-breaking day which led to the needed ride to France. Some young women who have denominational backgrounds that have been closed to charismatic things came to the Sunday service we were preaching at in Salinas and the Spirit of God moved on them very dramatically and filled them with the power of the Holy Spirit for the first time in their lives. They of course had lots of questions, which led to being able to minister to them even further later. Later that same Sunday evening at a get-together at a house, we were just saying an end-of-evening prayer together for traveling mercies with a group of about 15 people before leaving when the Holy Spirit descended again in power and touched some people dramatically then as well and ministered His grace and love once more in a remarkable way. We had another meeting we did later in the week with people from the Presbyterian Church in Salinas which again had the Holy Spirit falling in power on some unsuspecting people. A friend of ours had invited a guy who was a fairly new believer and who has no background in charismatic things whatsoever who ended up getting filled in a phenomenal way with the Spirit of God just descending on him before anyone even prayed for him. In fact, he just began to get touched and weep and was shaking under the presence of God and was blessed and filled in a phenomenal way. He shared that this was the absolute first time that the Holy Spirit had ever touched and filled him this way and he was amazingly blessed. God moved in power in Santa Cruz and we had a blessed time as waves of God’s refreshing grace swept over us after sharing through the night about many Holy Ghost stories we’ve experienced throughout the globe. Some visitors from Bethel Church in Redding were there which added to the blessings as we ministered to one another. We had some powerful divine appointments while taking a little time visiting nearby Monterey as well. A conversation opened up with a young woman we met working on the pier; she recently moved from Arizona and was seeking a new start in California. We witnessed to her about the Lord and she was quite receptive, we even got a chance to pray with her as she opened her heart to the message of Christ’s love. A little later we were riding bikes when we met a couple who started talking to us about miracles and Jesus Christ, it turned out they were doing the same thing we were, out witnessing the love of Christ. We ended up having an uplifting time of sharing and praying for one another before going out to reach more people—a little extra gas in the tank always helps!! 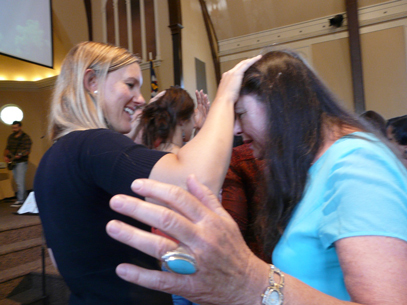 We met a woman later who started talking to us who turned out to be a backslidden believer who we prayed with that began to weep profusely as she opened her heart once again to Christ’s love and power. We also have been experiencing the Lord move upon and fill others with the Holy Spirit who have non-Pentecostal/Charismatic backgrounds down in Southern California as well. We’ve been involved in some “PrayerFests” with some friends of ours at some homes in places like Hemet as well as occasionally in Oceanside where we have seen numerous individuals with backgrounds ranging from Nazarene to Baptist experience the filling and empowering of the Holy Spirit as well. We even had a Nazarene pastor get filled with the Holy Spirit and speak in tongues at one point in these meetings. A young guy who was raised Baptist got filled and spoke in tongues for hours as the presence of God filled and empowered him in a phenomenal way recently as well. 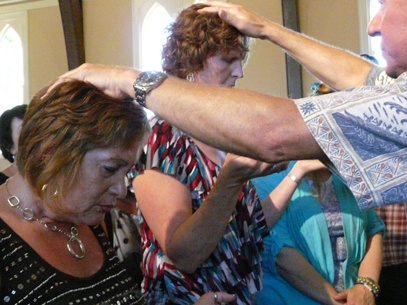 We’ve also been seeing the Spirit of God move in glorious ways in the Hispanic community while ministering in different churches where the Lord has just been filling, empowering, and healing many different people; we had some testimonies of those who were powerfully healed when we prayed for them in some recent meetings. Sometimes healing is a process, but it is a blessing when you have those ones that happen right in the moment as well!! Glory to God!!! It occurred to me while up in that area of the Central California Coast on this last trip that the Lord has been bringing us up to this region quite a bit in recent times. We’ve ministered in Monterey, Salinas, Santa Cruz and Oakland as well as in Santa Maria, Cambria, Los Osos, Santa Barbara, and Pismo Beach over time and it seems the Lord is stirring hearts in these areas. Salinas itself has a bit of that old style when it comes to the town and stands out as a place made famous by Steinbeck in the Grapes of Wrath and East of Eden. East of Eden, set in Salinas, was written as an allegory based upon the book of Genesis and portrays a modern parable with the struggle of Cain and Abel. The small town holds historical importance and seems to be one of the places where God is stirring things spiritually. We are blessed to see the Lord moving in power in these areas while we’ve been ministering there.